A couple of weeks ago, I published a few thoughts on the rather touching inscribed poem for Margarita, the lap-dog from ancient Rome. I would like to return to Margarita’s poem for a while and talk a bit more about (at least some of) the implications of these lines. The decision to revisit Margarita’s inscription was sparked by a fascinating text that I read more recently: a Greek papyrus in which a woman talks about the violence that she experienced from her husband – horrendous violence directed not only at herself, but also at her slaves and foster-children (P. Oxy. 6.903; text, description, and English translation available here [trigger warning: this text is not for the faint-hearted – the account of domestic violence therein is extremely grim]). Poetry invites us to fantasise, to drive imaginations to extremes – and fantasies quickly reach the limits of what we may regard as bearable (subject to ever-changing frameworks of morality and good taste). What in Ovid’s outrageous poem Amores 1.7 is intensely disturbing, becomes altogether sickening in P. Oxy. 6.903, where one must imagine that unspeakable violence has entered the real world. Back to the world of make-believe – back to the world as it was imagined in the inscription of Margarita. Margarita’s owners suggest that their dog was spared corporeal punishments – measures that, at first glance, one might be inclined to associate with animal abuse, as is still all too common nowadays. This association, as charming as it may seem to think of such animal lovers in the ancient world, may, however, be misleading. In my earlier post, I expanded on the affectionate way in which Margarita’s owners spoke about her – volunteering a few remarks about how their words relate to the way in which members of Rome’s lower classes tended to be commemorated in the Latin verse inscriptions (a genre that I regard as ‘the people’s poetry’). 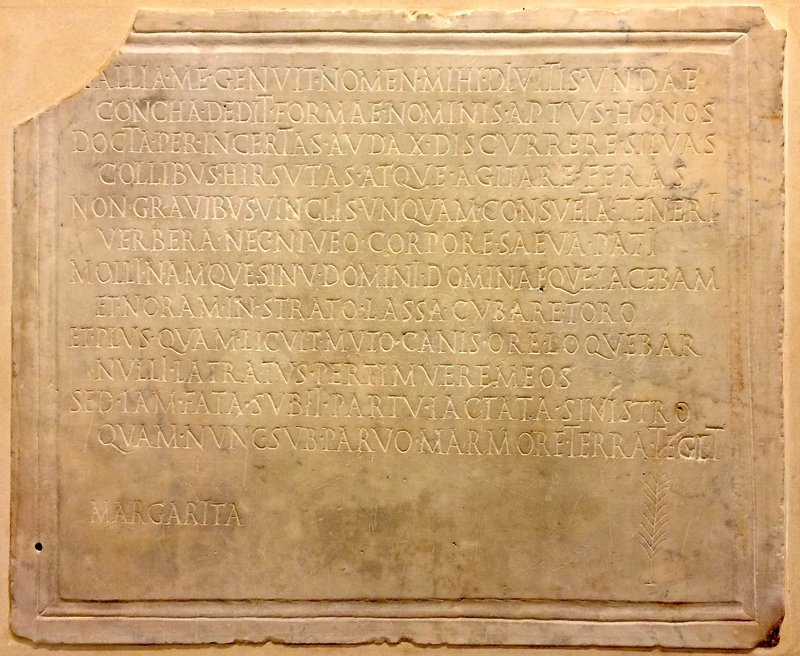 If it is indeed the case that Margarita has been presented as a (lowly, if dearly beloved) member of her master’s household (just like a slave girl or a freedwoman), then it is more sensible to ask how these words relate to how physical violence and abuse against underlings is presented in Roman inscriptions. Si ti Cicero do, vapulabis. If Cicero pains you, you’ll get thrashed. M(arcus) [Alf]icius Pa[ul]lus | aedil(is). | [si qu]is velit in hunc locum | stercus abicere monetur n[on] | iacere. si quis adver[sus ea] | i(u)dicium fecerit, liberi dent | [dena]rium n(ummum), servi verberibus | [i]n sedibus admonentur. Marcus Alficius Paullus, aedile. Anyone who wishes to defecate in this place, is advised not to linger around. Anyone who does so, will be punished. The free [rather than ‘The children’?] shall have to pay one (?) denarius, The enslaved shall be admonished with beatings on the buttocks. Eo magis me ca[stigavit dum] | dice[r]em mercem [nihil vale]|r[e] vel effunder[em p]r[o] | [ho]mine probo tuam maies|[t]atem imploro ne patiaris me | [i]nnocentem virgis cas[t]igatum | esse et domine Procle prae|[fe]cto non potui queri qua va|[let]udini detinebatur | ques[tu]s sum beneficiario || [Frustra et ce]nturionibu[s] | [ceteris] numeri eius [proin]|[de tu]am misericord[ia]m | imploro ne patiaris me | hominem transmarinum | et innocentem de cuius f[ide] | inquiras virgis cruent[at]u[m] | esse ac si aliquid sceler[i]s | comississem. … he beat (?) me all the more … goods … or pour them down the drain (?). As befits an honest man (?) I implore your majesty not to allow me, an innocent man, to have been beaten with rods and, my lord, inasmuch as (?) I was unable to complain to the prefect because he was detained by ill-health I have complained in vain (?) to the beneficiarius and the rest (?) of the centurions of his (?) unit. Accordingly (?) I implore your mercifulness not to allow me, a man from overseas and an innocent one, about whose good faith you may inquire, to have been bloodied by rods as if I had committed some crime. Maximus to Nigrianus. Such was the foresight of the manager that he (sc. put?) the girl, who was already pregnant, whom you had sent, to such labour that the master’s slave-offspring perished, who was made for great work, and Maxima did that too, the offspring of Trofimianus. Give him the strap, as if he’s been deprived of everything (?). Violence that may take the extreme shape of torture, as depicted in Pope Damasus’ epigram for St. Lawrence (which I have discussed on another occasion). With Damasus’ epigram we have, of course, re-entered the realm of (inscribed) poetry – a world in which objectivity has been suspended in favour of whatever a poet wants to make believe. Unsurprisingly, references to violence against family members (in the wider sense of the term family – familia rather than gens) are almost entirely absent from the Latin verse inscriptions. But the fact that it is not really talked about does not mean that there is nothing to talk about. Where references finally appear, like in the context of Margarita’s epitaph, they appear in the negative, stressing their absence. nec duro iam doleas obitu. uiuis, ad Orchum quid ualet? hic nulla est diuitis ambitio. [H(oc) m(onumentum)] h(eredem) n(on) s(equitur). Gaius Ofillius A[eimn]estus, freedman of Gaius, of the tribus Palatina, while still alive, (sc. has erected this monument) for himself and his wife Mindia Prima, daughter of Marcus, and his son Gaius Ofillius Proculus, son of Gaius, and [empty space follows]. The barbarian land that had given birth to him handed him over to the city of Rome in slavery, so that he unduly changed his character. He made every effort to have his name, inherited from his father, aggrandised, and at a price he obtained what he was denied at his bidding. He overcame his master through his sense of duty, and he did not experience beatings. He did not receive any rewards, wages within his ability. Why do you rush, stranger, see, there is a place prepared for you to relax. This resting area is open to the people always and everywhere for as many hours as . . . [the remainder of the text here is too fragmentary for it to be rendered in a meaningful way; a gap follows].
. . . nor feel pained by a dire death. Neither you nor us had been granted to live forever. You believe fate is to blame, because we die as young boys? While you are still alive, to lose one’s life seems like pain; but as soon as we die, you spurn everything. If you have the entire world under control while you are alive, what difference does it make to Orcus? There is no rich people’s canvassing for favours down here. This monument does not go to the heir. Was this, in fact, an exception to the rule – or why did Ofillius Aeimnestus, in modern terms a victim of commerce and human trafficking, choose to mention it? te matremq(ue) tuam tempus enorme tulit. liquisti moesto vulnera dira patri. quod matris tumulo iungeris ipsa cito. My light, Siricia, robbed by the divine scourge – an extraordinary time took you and your mother (sc. away from me). Growing up, you had not yet reached six years, and you left your father with dreadful wounds. Lo!, you have re-opened a closed grave with the mourning that you left behind, as you joined your mother’s grave yourself so quickly. Violence within the family, within a strongly patriarchal system, is a topic that gets swept under the rug all too easily – a difficult topic, easily concealed behind words that dream up an ideal world in which everything is in perfect order, in which family members are described as obedient and dutiful, as is the case in an overwhelming number of Latin inscriptions, especially for wives and children. It is when violence is almost accidentally addressed in terms of its absence, that one must wonder as to what the realities of life were. Margarita, it seems, was a lucky pup. This entry was posted in Carmina Epigraphica, Epigraphy, Poetry and tagged ancient Rome, Big questions, Dogs, Domestic Violence, Herculaneum, Poetics, Pompeii, Pope Damasus, Torture, Underdogs, Violence. Bookmark the permalink.